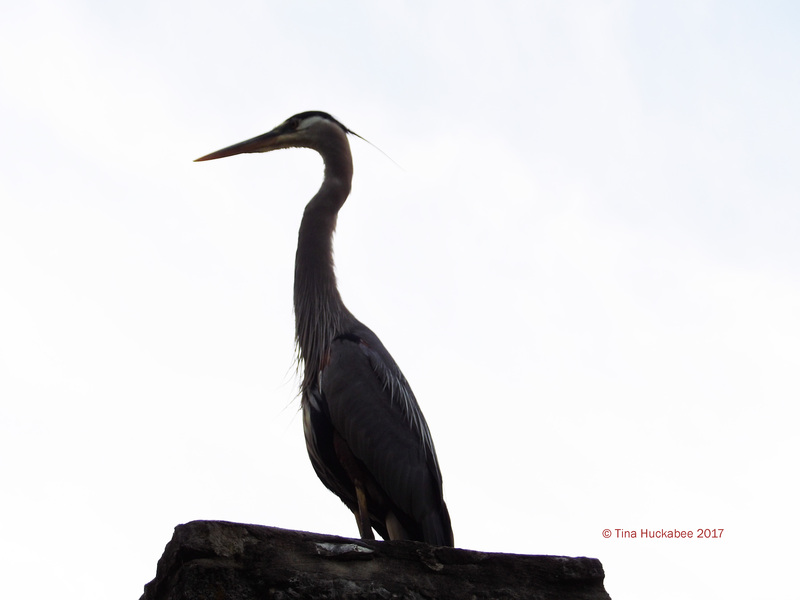 Against the early morning sky, the heron is regal. 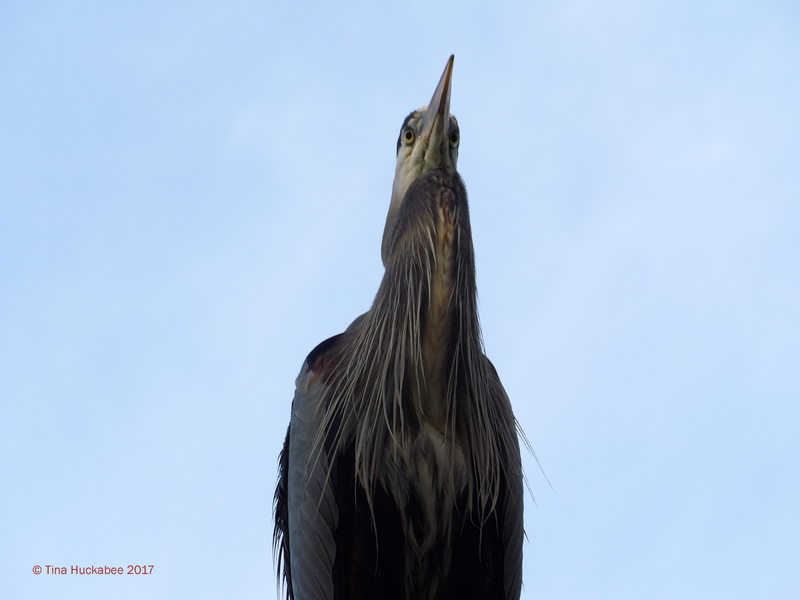 I knew there was a Great Blue Heron, Ardea herodias, fishing at our pond as a neighbor alerted me weeks ago that she’d spotted it on the roof of my house early one morning. Indeed, that same morning, one landed, practically on top of my head, though fortunately the patio cover was between my head and the heron. I spooked him with my excitement and after that morning, over time, the four remaining goldfish disappeared from the pond, though no human in this house witnessed a hunting heron. Intent upon his goal: the pond and its fishy gifts. There are gambusia, native mosquito fish, in the pond and they’re valuable assets for that ecosystem, but I like having a few goldfish in the pond because, well, they’re pretty. But this guy or gal has other ideas. This morning he landed when the cats and I were making our morning rounds in the garden. I scooped up the cats, made my way indoors and waited for him to act. 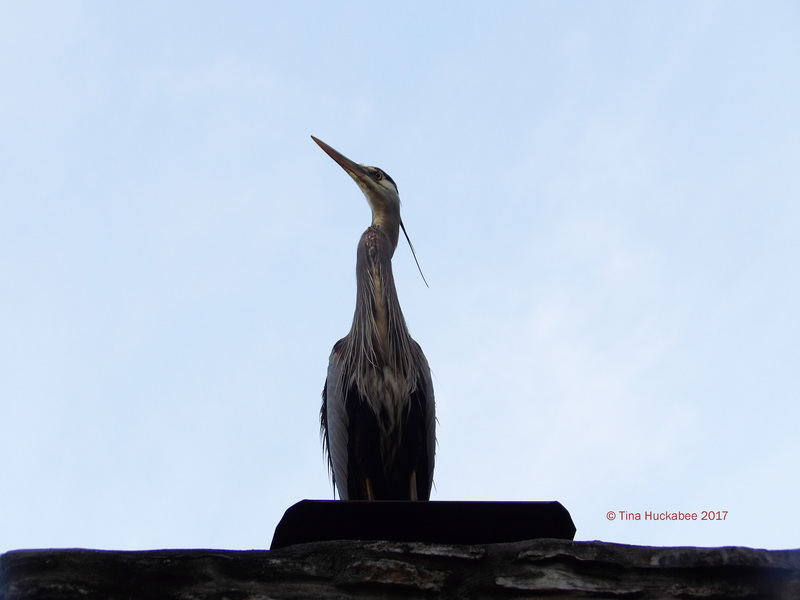 He sat on the top of the chimney for about 15 minutes and then, slowly and cautiously, made his way to the pond. No goldfish, buddy, but plenty of little gambusia. Before he could complete his fishing expedition, he was frightened by a noise and loped off, spreading those wings wide. The poor little fish are always vulnerable to heron hunting after I separate the pond lilies. This year, I’ve waited weeks for one of the lilies to return and send up its pads, but that hasn’t happened. I realized that the lily died (no clue why) and just this past weekend, purchased another. Soon, the lily pads will cover most of the water surface, keeping the water temperature cool and acting as a cover for the fish. 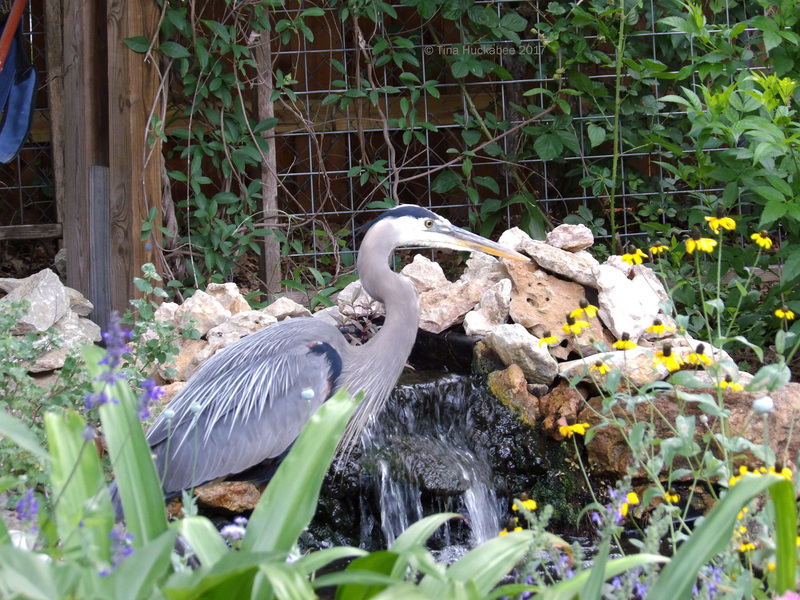 But until then, the Great Blue will be back for more easy pickings from “his” pond. 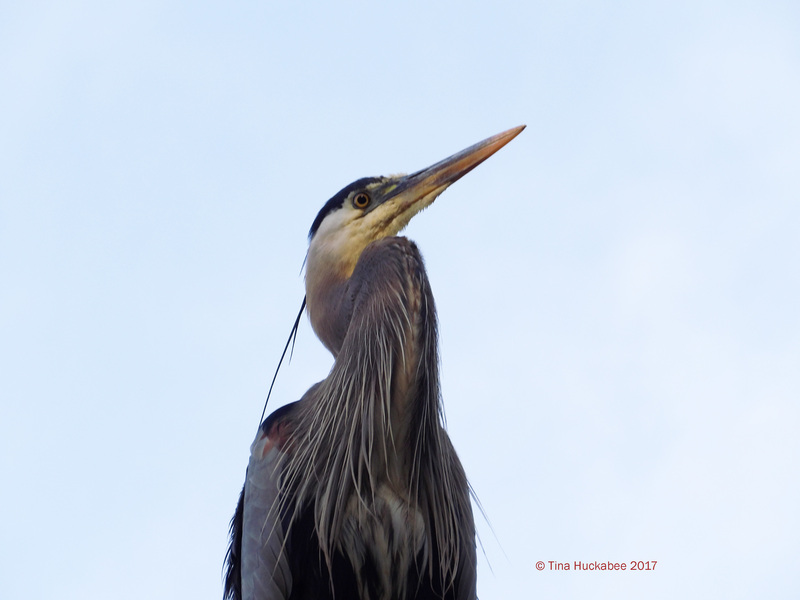 This entry was posted in Ardea herodias, Great Blue Heron, Uncategorized and tagged Backyard Birding, Biodiversity by Tina. Bookmark the permalink. I’m honestly torn…. I hate the idea of your pretty goldfish getting snarfed up for heron lunch, but at the same time…a heron! In your back yard!!! I’m excited just reading about it! Hopefully those lily pads will be back in action soon, at least giving the remaining fish a chance to safely lurk unseen and uneaten. Will you get more goldfish for your pond when that happens? Yeah, mixed bag that one! Every spring it’s the same story: heron visits, sometimes a fish or two disappears. This year, all goldfish and probably, some gambusia, were on the menu and the heron had opportunity, due to the lily’s late foliage. Oh well, so goes wildlife gardening! I now have my requisite two lilies and as it warms, the foliage should really take off. I’ll hold off buying any more goldfish until the pads have covered more of the surface area. But the heron can still catch the gambusia and there’s not much I can do about that. You always get the best shots. I can’t believe the heron fishes in a backyard pond. Is there a larger body of water nearby that they usually use? Judy, it really was lucky this time and the heron just stood still and posed. Herons have visited every spring for the last few years and this was the best set of shots I’ve ever been able to get. Yes, I’m not too far from Shoal Creek, but there are creeks running through Austin so waterfowl aren’t all that unusual to see. Tina what a thrill and how wonderful to have a Heron in your garden !!!!!!!!. The pictures of the Garza are magnificent. What will a Heron do in its pond? Is there a pond or lake or river near your house? Because it is very rare to enter the streets full of inhabited houses. Well your house is special and it is the shelter and food for all animals. We have just seen it with the Heron that has eaten its goldfish and has not eaten the small fish because it has been frightened. Poor colored fish, but I think they have been worth it in exchange for having the Heron in your garden. Greetings from Margarita. Yes, it is a real treat to have a heron. I’m sorry for the fish, but that’s part of wildlife gardening. I’m fortunate to live in a fairly bird-friendly town and most folks who have ponds occasionally have various types of herons visit. A happy ending for the fish! Great shots of the Heron. This is one reason why, if I had a pond, I doubt I would purchase goldfish for it. Though I’ve seen some people place nets over their water features to protect the fish. Well, they’re not called “feeder” fish for no reason! 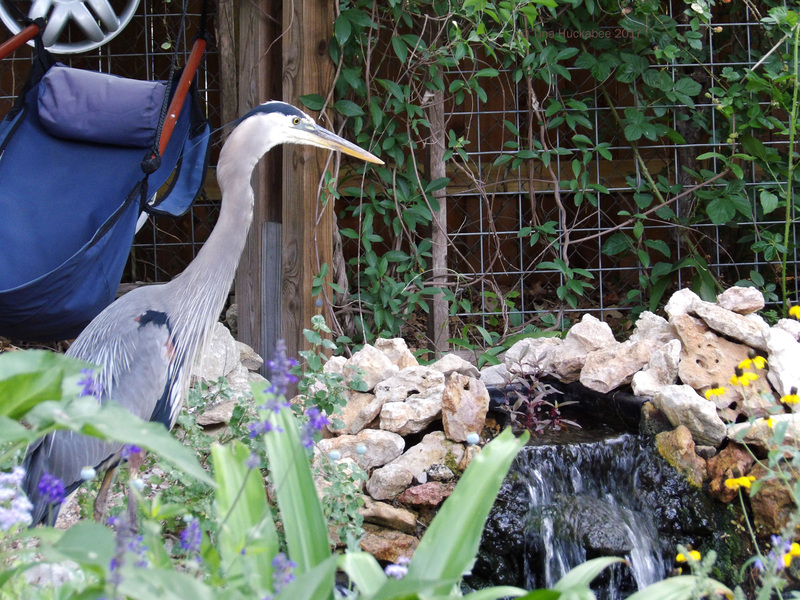 Even if I didn’t have the goldfish, Mr/Ms Heron would come for a snack and catch gambusia and a pond really does need fish to control mosquito larvae–and, to be a complete ecosystem. I imagine if I invested more than 25 cents for a fish, I’d net my pond, but most years, I don’t necessarily even lose one goldfish. This heron was smart enough to take advantage of a slow (turns out dead) lily and therefore, open fishing. Bad for the fish, good for the bird. So sad but, yes wading birds are opportunistic just like lots of other wildlife. If that had happened to my fish, I would have been upset. (I don’t have a pond but, hope to have one before I die). I envy your pond with circulating water. Did ya’ll install the pond yourselves? Great shots of the regal thief. Yes, we built the pond about 8 years ago. There are a few amateur glitches, but mostly, we’ve been very happy with it. Don’t hesitate to build one–you won’t regret it and it really completes a garden. “Regal thief”-that’s good! 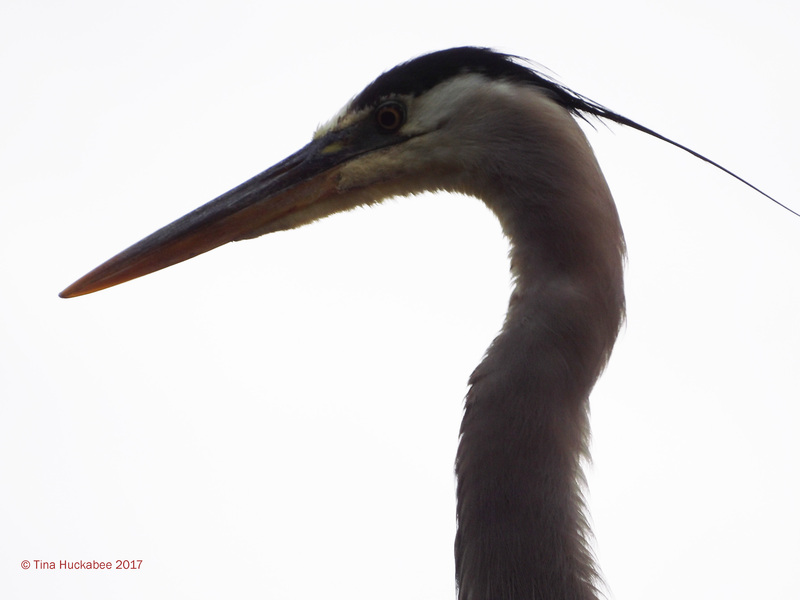 I love watching herons fish — not only the great blues, but all the others we have: night herons, least herons, green herons. The little green herons are great fun. They’ll hang out on dock lines in the marinas and fish from there. How they manage to snag their dinner without falling off the line I don’t know, but they certainly have a grip. Great photos, for sure. And what memories. Not everyone can get such a return on their goldfish investment! I agree that herons are fascinating to watch. This guy, though he stood his ground (or, chimney) was aware of every move I made. Green herons have visited the pond too. Not only are they beautiful, they’re fun to watch as they sneak through the bog! I’ve never had any issues with raccoons in my pond–I should be very grateful, I think. They mess with the bird feeder on occasion, though and like to dig around in the compost. 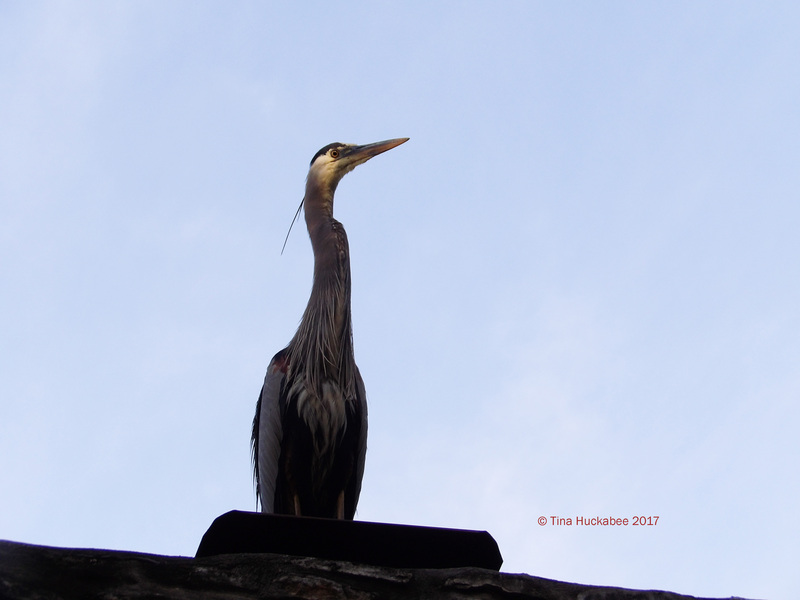 Love your photos Tina and the great story of the visit by the heron. I have a similar problem with the goldfish in my pond. They are nice to have, but don’t seem to last long with all the bird visitors we have! Thanks, Sue! This is the first time that all of the goldfish have disappeared. I can’t blame the heron, it’s what he/she does. Everyone has to eat! Wonderful photographs Tina – I think I would donate a few fish for the privilege of having him strut around my garden. He does look rather as if he paused for your camera! Haha! Yes, it’s quite something to have a bird that big in the back garden! I was amazed that he stay on the roof for so long–that’s never happened before. Hopefully there will be other occasions – when the lily has leafed out to hide the poor little fish! Now that I’ve replace one of the lilies, both will fill in fairly quickly–the fish and I hope! Cool! But sad for the fish. 😦 We don’t have a large pond, but we keep our little pond closed at night to keep out the raccoons. 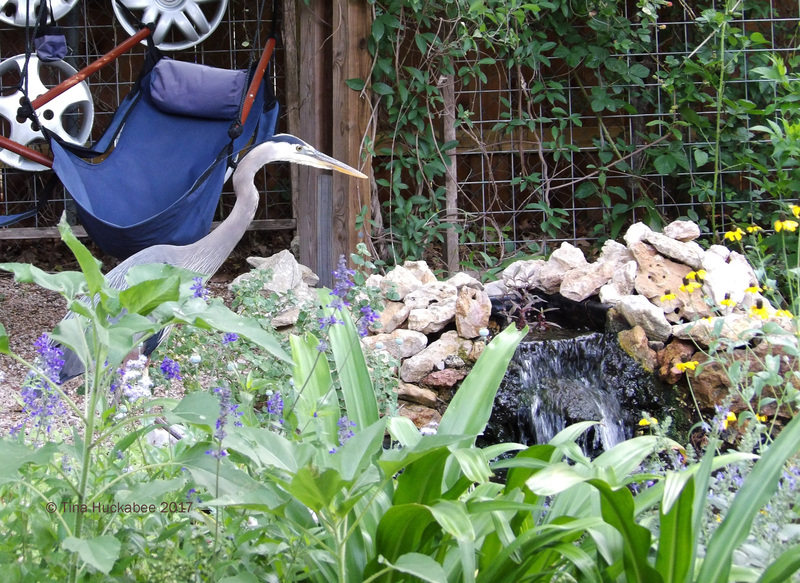 I can’t imagine having a heron in the backyard–that would be awesome! Yes, it is a bummer for the fish and I’m really surprised that all of them are gone, but so it is. Raccoons are so destructive, I’m fortunate that they’ve never bothered my pond. It was awesome!! I feel for you. We’ve lost a great many of our fish to herons over the years. I usually only see the herons as they fly off, but can’t help being excited by them nevertheless. Poor fish though! Herons gotta eat, too! I can’t be upset at these losses, I know the risks to the fish and this is the way of wildlife gardening. Yes, we were very excited to see this beautiful bird and so glad he stayed for a while. 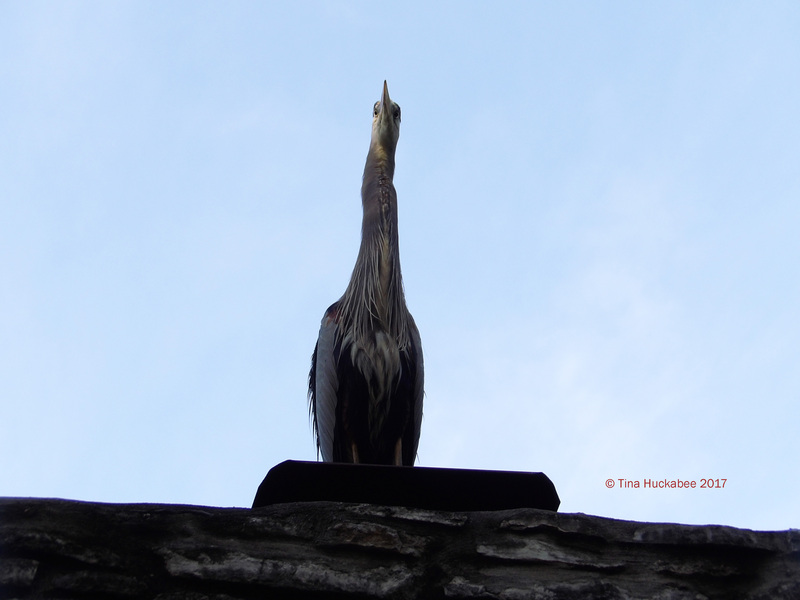 A Heron – how exciting!! As always, just wonderful shots. I think you really managed to capture his expressions well, as he was pondering (no pun intended) his next move. Great story! Yes, very exciting! I was surprised and tickled that he stayed so long and posed so well. That’s never happened before. Thanks–it was a thrill and I agree, the fish gave to a good cause! Everyone has a belly, and while sometimes I may not like whose belly fills with whom, I’m glad the larger ecosystem is alive and well.